Our Australian customers are currently facing the busiest time of the year with summer finally being here and Christmas approaching! Luckily some of them were still keen to take some time out of their schedule to talk to us about SortScape (Thanks guys!). We get to chat a fair bit to the business owners when trying to figure out where SortScape is going next, but this time around we’ve had a the unique opportunity to talk to the teams that use SortScape on site. Even though the bulk of the scheduling is usually done in the office there are plenty of times when a new job or a tip run (that means ‘dump run’ to our American audience) has to be added to a job run. 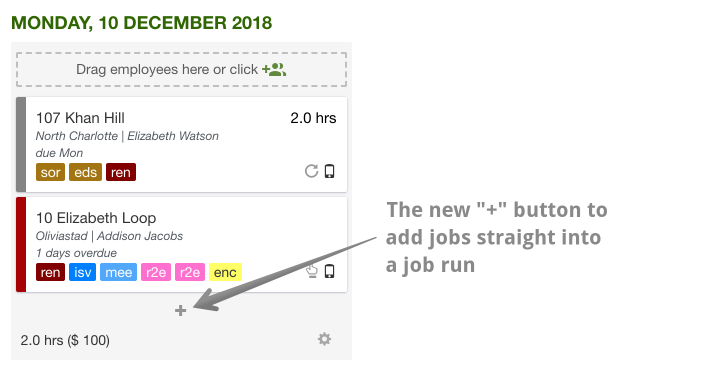 To make this easier you can now add jobs straight to an existing job run by hitting the “+” below the last job in that run. Another big feedback item was general performance on mobile. We took that to heart and managed to shave off almost 50% of the time it takes to load the schedule view as well as the job view as those are the views that get used the most when on the road. While we were at it we also changed the job view to remember the position in the schedule which together with the performance improvements makes the mobile experience a lot more snappy to work with. But as important as it is to improve the experience in the browser, we heard you crystal clear: You really want a mobile app for SortScape. Obviously this means you only ever have to login once, but it also means that we have even more control over the performance as well as being able to leverage mobile features like push notifications and GPS tracking. The good news is that we are heads down now building a first version of the mobile app which we can hopefully share with some of you in the new year to get feedback. Stay tuned!